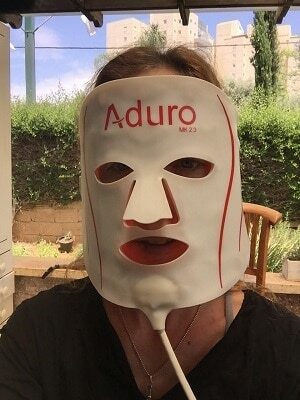 The Aduro LED light therapy face mask is the 4th mask we reviewed (yes, we’re a bit obsessed) and the second one we tried for at least 30 days. We were not paid to try this LED facial mask, and we were not given it for free. We still REALLY wanted to try the Aduro 7+1 LED face mask. In this post, you’ll see why these qualities made us so curious, how we used it (for 30 days), our review and our results (plus before and after pictures). 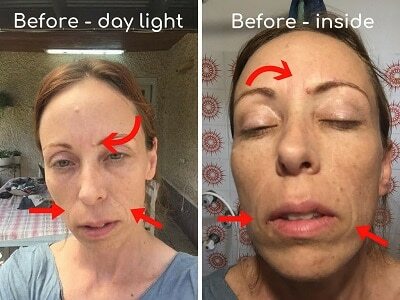 1.2 LED facials at Home: Any Downsides? Which color do you need? Should you combine multiple colors? And for how long? The Aduro LED mask includes 11 different pre-programmed treatments you can choose from. This is the most important feature in the Aduro LED mask. Because it eliminates confusion about which colors to use and for how long. You just choose the “acne buster’ option on the controller, and the mask lights up with the blue color wavelength (proven to destroy acne-causing bacteria) and shuts off automatically after the required treatment time. Choose either “skin booster” (infrared + red) or “wrinkle reducer” (red) from the controller – and go do whatever you want until the mask shuts off automatically. ✅ Skin booster – combines both red light and infrared (invisible) wavelengths – proven to promote collagen production in your skin, improve skin tone and radiance. 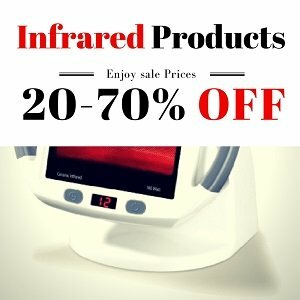 Infrared wavelength, which is felt as heat, penetrates deeper into the skin and promotes healing of the skin and pain relief. ✅ Acne Buster – blue light therapy was scientifically proven to kill acne-causing bacteria (up to 70%), which effectively treats blemishes and acne spots – in just a few days. It’s the best treatment to prevent acne breakouts. ✅ Cell Rejuvenation – this treatment uses purple light (red with blue), which can increase cell regeneration, prolong cell-life and cleanse the skin. This treatment is great for a combination skin. ✅ Skin Balancer – green light can even the skin complexion, treat hyperpigmentation, dark circles, and redness. ✅ Red away – yellow light can reduce redness (red light is also proven to be effective for Rosacea) and treat sunburns, psoriasis, and eczema. Click here to get $20 OFF with our special coupon code Meital04 – while it lasts! ✅ Pain Blocker – cyan light therapy can reduce inflammation, and has soothing and pain relieving properties. It can also reduce swollen capillaries. Great for facial spider veins. ✅ Radiant Skin – orange light is known to promote skin radiance and promote a brighter glow. ✅ Wrinkle Reducer – Red light therapy promotes collagen, treats scars, reduces inflammation and redness and promotes skin rejuvenation. ✅ Daily Dose – for everyday maintenance. Cycles through each color wavelength for overall wellness and rejuvenation. ✅ Quick Fix – which cycles through Primary and Secondary light wavelengths for Radiant skin that offers you a collagen boost, anti-redness, anti-inflammation, and wellness. The Aduro LED mask kit is 100% portable. All the other masks we tried or researched were not rechargeable, which means you have to plug them into the wall and stay put while you use them. The Aduro LED mask kit is a rechargeable mask and comes with a USB cable for charging. You can sit back and relax, but I used it while washing the dishes, doing the laundry, playing with your kids (though they may get a little distracted…) and you can easily take it traveling with you. The Aduro LED mask is the only one which includes invisible infrared wavelength, which is proven to naturally and effectively relieve pain. If you suffer from painful acne, Rosacea pain and redness, or any other skin condition that causes pain – choose the “skin booster” treatment, which includes infrared. 5. Weighs Only 7 Ounces! The Aduro is the most lightweight mask we’ve seen or heard of. This one is made with medical silicone, which is flexible (it easily conforms to the shape of your face) and lightweight. Start on a clean face by removing any traces of makeup and dirt from your skin by using a makeup remover and your facial cleanser. Choose your program, according to the skin condition which bothers you most. Sit back and relax or go about your business as usual – it’s up to you. When the mask automatically shuts off, apply your preferred moisturizer. The manufacturer recommends using 4 times a week, but we think that 5 times is even better. Seeing results will take time. We would expect visible results only after at least 2 weeks. Before we tell you how we used it and how it works, I’m sure you want to see my results, right? Right now, you can get $20 OFF with our coupon code Meital04 HERE – only for our readers! I also noticed a slight improvement with my hyperpigmentation and skin redness between the eyebrows. Overall I’m thrilled with the results (been asked a few times if I’ve “done any work”), I think that this mask is well worth its price and definitely will continue to use it for 30 more days or longer. There is the mask, the controller with all the treatment options, instructions, and a charger. The mask It is a thick rubbery feeling mask which fits well around the face. The edges are quite soft so I think it will fit around all face shapes. The back of the mask is joined by velcro and It holds up well with no slipping which is important if you want to get on with doing things while the mask is on. Each treatment lasted 20 minutes before the mask automatically shut off. It was extremely easy to use. I fully charged it with the USB cable, and the charging lasted for 4 treatments each time. I only strapped it on my face, chose the treatment from the controller, and usually proceeded to do my dishes (or just resting on the sofa). The mask leaves the skin slightly warm (in a pleasant way), especially if you use the treatment that includes infrared light therapy (which is experienced as heat). 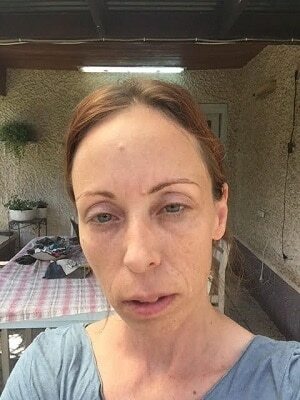 I followed each treatment with a Vitamin C serum and moisturizer. The feeling afterwards is great. If you allow yourself the time to sit back and relax – you’ll enjoy a stress relief bonus – which all of us need. I masked 5 times a week – allowing my skin to regenerate on the weekends. LED facials at Home: Any Downsides? The main downside of this mask is probably the price. It’s over $300 (with free international shipping). If you set aside a budget for a beauty gadget, this one is a good investment. Its portable design and ease of use will help you stick with the treatment – which is the most critical factor in LED treatments success rate. 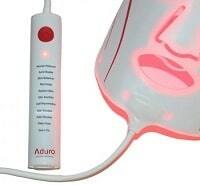 The Aduro LED mask price is about the same as 6 LED facials in a clinic (which will get you nowhere). But when you have this mask at home, you can use it indefinitely and keep enjoying the results. 👉 If you purchase, use coupon code Meital04 to get $20 OFF. This discount can end at any moment. This makes this home LED mask a cost-effective investment. After using this mask 5 times a week for 4 weeks, I can definitely recommend (and I have – to my friends and family) the Aduro LED mask. I recommend buying the Aduro Mask from the official US seller. Get $20 OFF with our coupon code! 👉 Use coupon code Meital04 to get $20 OFF the price. This discount is time sensitive and may end at any moment. The portability and ease of use increase the chance of sticking with the skin care treatment and seeing visible, satisfying results (I’ve been asked numerous times whether I’ve done Botox or a facelift). It includes all colors and treatments for all skin conditions. Like I said in the beginning, I was not paid to review this mask, or given it for free. This is my honest opinion. Questions? Comments? Looking forward to reading them. Interesting article, but some points that should be cleared up. Currently, the Aduro mask is not listed on the FDA site as being cleared for any indication. In addition, a number of the colors that are listed by the manufacturer have never been clinically proven. Green, for example, is often cited as having an effect on pigmentation, but there is no clinical evidence for this, the same for orange. I am not aware of a single study on Orange wavelengths? Moreso studies show red and NIR have an effect on pigmentation (see the publications on acne and wrinkles by SY Lee). 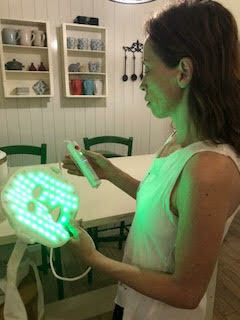 The Aduro Australia LED Mask is TGA Listed in Australia and. The TGA is the Australian equivalent of the US FDA. Is it good for gents too? Thanks for the review. I used your link to make the purchase. I just wanted to ask as its been a few days, when you made your purchase, did you receive a confirmation email from aduro directly? I paid through paypal and received a confirmation from paypal but haven’t received anything from Aduro. Reached out to their digital sales team directly but am still awaiting a reply. Grateful for any information that you could provide. Thanks! I’m sending your question right now to their sales representative in the US and I’ll let you know their answer as soon as possible. Just wanted to let you know they got in touch with me and I have now received my LED Mask :) Thank you for helping out! Hope to see good results like you! I am really considering getting this mask and am still nervous because of the price tag and no satisfaction guarantee. How are you liking it Veronica? I am 52 with pretty good skin, however the crows feet, and eleven lines are getting on my nerves! Just want to look as best I can, and would use this in conjunction with my microcurrent device I got a year ago which has helped a lot. Thanks for answering! Hi … I bought this using the link via Paypal and did not receive any confirmation from Aduro. Tried to email their customer services email address listed on their website but the email bounced back to me as the address was not recognised. I am now concerned this is a scam. Can someone help? Don’t worry. You probably did not return back to the site after paying with PAYPAL, which is why you didn’t get a confirmation email. I know this from experience. I’m sending your details to their sales representative right now and they’ll be in touch with you soon. Again, don’t worry about it. I got a message from Aduro that your order has been processed and being sent to you. Enjoy! Would this be a good option to use for hair growth? I don’t know I never tried it for that purpose. Have you seen my posts about the best devices for hair growth? I was hoping to get a product that I could use on my face and to stimulate hair growth. I’m limited in budget, and thought this would meet both needs. You can use for both your hair and your face. Just make sure to follow instructions carefully. Hi do you recommend this over project E for acne rosacea (papulopustular rosacea) ? 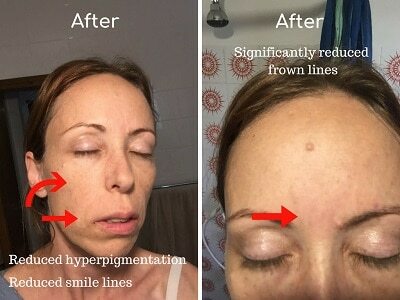 What about for wrinkles which of the 2 showed better results? They both delivered the same results for me. However, if you only need 2 lights (blue for acne and red for wrinkles) – you can go for the Project E one, which is less expensive. This is just what I think, I hope it helps. I heard that red light can bring melisma back and i should use green light instead. Are you aware of that ? I am interested in buying Adure but i prefer to use red light. 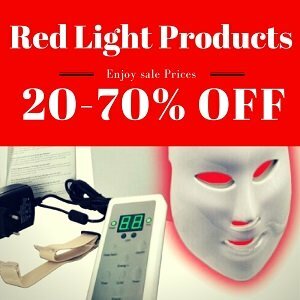 There is conflicting research about red light therapy and melasma. Some say it improves it, some say it can worsen it. Yes, you can use green light instead, and the Aduro that you are interested in has the green light, along with many other lights – each one can be used separately. I hope this helps and good luck! Infrared light (heat) and laser or IPL does in fact make your skin appear better AT FIRST, then melasma may come back worse than ever. My dermatologist was very specific about this since I have very bad Melasma (not to be confused with other types of hyper-pigmentation like freckles). Melasma is a hormonal-caused skin condition and is very, very difficult to treat. My dermatologist said absolutely no lasers or IPL or sun, since all his patients returned with worse melasma. Any “heat” element, such as the sun, IPL and lasers can INCREASE MELASMA. To date, the only FDA approved treatment that has results for melasma is the “Cosmelan Mask” only provided by dermatologist, followed by the “Cosmelan II” cream for continued results. I agree, green light is the safest light to use for Melasma. Hello! What is the strength in nm’s ( I guess that’s nano meters? ) of this mask? I see it listed for some of the masks but not all. I love the review but I want the strongest possible nm’s for the price. The Deese lists theirs as 630nm. I also want to treat my neck. If I buy this mask which wand do you recommend in conjunction with the mask to cover face and neck areas? Thank you for your research. It has been quite helpful. This is a confusing area of beauty care. I am taking from your research that you want to buy the strongest nm’s available and have infrared light as well as led lights in the device. Is that true? The very expensive Perfectio ($4,000) seems to heat up helping absorption? I am about to purchase something but of course I am not buying that one. I’m just wondering how it is different and why they charge so much? The wavelengths used by the mask are not the same as strength. Each light serves a different purpose. For example, the red light is 630 nm, and the blue light is 415 nm. Infrared light is about 830 nm. This mask has many different wavelengths – each color has its own. The Aduro comes with a wand and you can try and strap it around your neck to treat it. However, you should make sure that you don’t have any thyroid problems, because there’s some controversy about using light therapy on the thyroid area. Some research says it’s helpful, others say it can cause some damage. The mask that you mentioned (Perfectio) heats up – this means that it uses infrared light – which is experienced as heat. What do you apply on the face before the LED light therapy? Can you use Aloe Vera? Light therapy should be used on a clean face with nothing on it. After treatment you can use anything you’d like, including Aloe Vera of course. Just don’t use any cream that causes light sensitivity in the skin (like retinol). What about the ultrasonic device from project E that has led light therapy as well? They recommend using it with your moisturizer /aloe vera gel or creme to absorb it better. 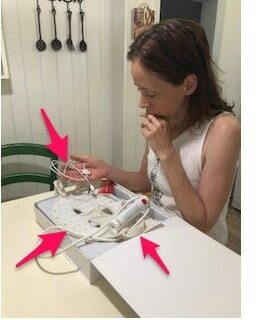 Do you think that the LED light will cause a side effect with the aloe vera in that device? It won’t cause a side effect, but it may slightly interfere with the red light penetrating the skin. Is it on stock? I can’t find it. Hi! Does this limited number of treatments? Thank u! No, there is no limit on treatments, it should last for years. Thankyou for the great review, it was very helpful. I just checked Adura’s website and the mask you reviewed is sold out. Would you be able to find out when they’ll be available again. If it’s easier, you could also pass on my info as in the previous post. Thanks! I would like to buy but I can’t get through your website. I ordered my unit Sept 22. From Aduro web site. Received Oct 3. Trying for first time. Hope to test the pain feature also. hi this doesn’t deliver to my address in the US through amazon how else can I purchase this? Hello, I really want to get this now! Great review! However, I was wondering, do they ship this product to Canada? I really hope so! Thank you. One more not – if you order through the Australian website you can use our special discount code LIGHT10. Are u still using the mask? Been using mine everyday for about a week now. I believe that I am older than you …have more areas to improve. One area I am working on is wrinkles/feathering around my mouth. Currently using red/infared. The mask does not have a light strip in the area under the nose. I know the light somewhat reflects onto that area. But don’t know if it’s adequately working without direct contact with a light strip. Do u have any info on that subject? Have u tried it on neck, chest or hands? Hi, is the Aurora the one you recommend for roseacea ? Also my biggest treatment area is my nose. 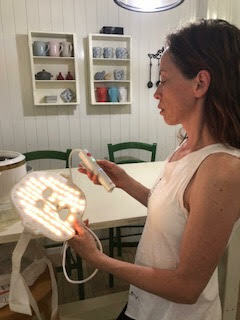 Yes, Erin:) I recommend it for Rosacea – use the blue light and then the red light. I think that one of the plans on the remote control has a combined red & blue treatment. Don’t forget to use the coupon code and good luck! The website is so slow. Is there an alternative website? Let me know if you experience any more problems. Thank you. I am trying to get on the Australian Website, and it is not loading, do you know of any issues? Thank you for your all information about these masks. I would like to ask you some question before go ahead. I don’t really know which type of skin I have but since I am little I have always had circles red and puffiness under my eyes. And I don’t have so much collagen around my eyes so turning now 23 I start to see that when I smile I have wrinkles and lines of expressions ( or maybe because getting old or smoking ) under my eyes and around my eyes. I always look old! And my wish is to fix this area as is the only area that makes me feel old and tired. Also as I really don’t have much skin around my eyes I can see 2 veins in both eyes area. In one is more visible than the other . would like to ask you which one can be the best treatment for my eyes area and also my mouth area. I would like my skin overall very fit no imperfection of holes when I am smiling. But as much symmetric, as I can. I would like to send you a picture of my face so that you can understand better my problem. Also if u have any eyes cream recommendation can be a really helpful information for me. The important is that works. Milena I would definitely try a LED mask. The effect of red light therapy can be seen on your entire face, not just specific areas – because it increases circulation all over your face. As for eye cream – I use Castor oil mixed with some coconut oil and it works great for me. Have you tried the Beauty by light LED mask? Its at a much cheaper price but boast similar programs? I was wondering if you could do a comparison? I’m stuck between both, mostly for the price. Hi – when wearing the mask, how do you keep your eyes safe from the light? 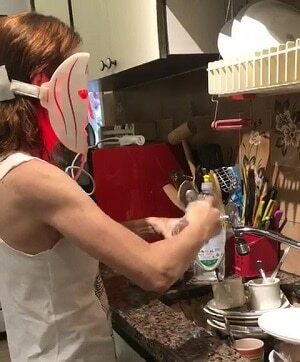 I want to do chores while wearing the mask but I’m concerned about damage to my eyes. To me, the light doesn’t feel too bright. If you strap it well enough so it doesn’t move – you will hardly notice the light, and there are no bulbs directly near your eyes. If you are concerned you can choose to not use while doing your chores and use a folded piece of cloth over your eyes and close them. Hi Meital, Got my mask today, and wearing / writing just now! Quick question on the 3 programmes you used (alternating) 5 times a week. A take that to mean the full 20 minutes on each programme, but only used 20 minutes x 5 times in a week. You don’t mean 3 x 20 x 5, correct? Hi – I use a retinol product at night. Do you know if it’s safe to use with it? I know to use sunscreen with sunlight but didn’t know if these wavelengths were different so it’s safe to use. Thanks! It’s not safe to use red light therapy after using retinol because it causes skin sensitivity to light, that’s why you are using sunscreen. If you do, make sure to use the mask at least 12 hours after the retinol. Which mask would you recommend the Aduro or the project e mask? I have acne scars, occasional break outs, developing Melasma, and some fine line are starting to form. I recommend both, but the Aduro costs much more because it’s more comfortable to use. It really depends on your budget and how much comfort is going to affect you with being consistent. Consistency is key to seeing results with treatment. Hi, is this mask safe to use with Dermal Fillers and Botox? Through my research, in most cases using LED therapy will not cause fillers or Botox to dissipate more quickly. Normally a person should wait a couple days to let the fillers settle a bit, then start using the LEDs slowly. My face is very dry after washing my face. Is it ok to put on a serum prior to putting on the mask so my skin wouldn’t be so dry while having the mask on? Will it create the same benefit? It’s recommended to use a serum only after treatment to get the most benefits. It’s the same mask and the same manufacturer in all the websites. And yes, it comes with a US plug. Hi, I just received my mask and I was wondering how do you clean it? I read in the directions to use a damp cloth but it’s leaving behind lint when I do it. I’m thinking of purchasing some mask wipes that are alcohol free. Any suggestions? Thank you for your post. I followed the link to the US site and paid through PayPal. Wondering if you can pass the representative’s contact info along to me? Hi Pamela:) Was there a problem with your payment? how can I help? No problems…I’m in the military and moving soon overseas, so didn’t know how long it usually took to ship. Can I use this on my scalp to regrow hair, I have psoriasis and I know that infrared and red light therapies help. Wondering if this will work on my scalp, I wanted to get a two-in-one device as well as and he aging. Do you know if this is delivered to Canada? If there’s extra charges at all? Warranty? Yes, the Aduro mask will deliver to Canada with free shipping. There’s a 1-year warranty. I hope this helps.